This made from scratch Cinnamon Roll Cake recipe is the taste of cinnamon buns in a fraction of the time! This cake is absolutely delicious. Hi guys! I have the best best BEST cake to share with you today! I have made plenty of different cakes in my day, but I get really excited when I find a winner that I can make my new “go-to”. Cinnamon rolls are probably my number one favorite food in the entire world and this cake mimics them without having to spend hours rolling, kneading, rising, etc. 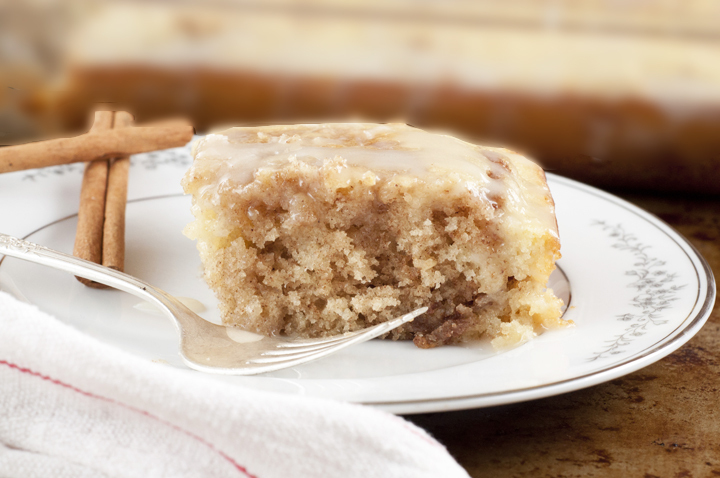 This cinnamon roll cake is made from scratch so it obviously takes a little bit of time to put together, but totally worth every second. This amazing cake recipe I’m sharing with you today is the absolute perfect choice for brunch, breakfast, dessert, party or any time at all! I brought this bad boy to Mr. Wishes’ annual company ski night because I had no idea what to bring and I was craving cinnamon rolls. Since cinnamon rolls weren’t really ski night appropriate and I don’t like to be judged, I decided on this cake. I had several people ask me for the recipe, which is always the utmost compliment in my eyes and makes the time I spend blogging all the more worth it. I even had an 11 year old girl (Hi, Lilly!) come up to me and say that it was the best cake she has ever eaten in her life! Way too cute. You always want to be the person at a party that has the dish that stands out the most, ya know? Perfectionist goals. Desserts are normally where I shine (or so I like to think) so I’m glad I decided to go with sweet over savory for this particular event. 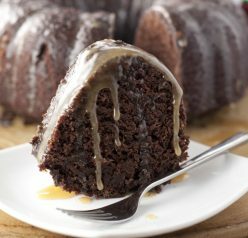 Make this cake as soon as possible! 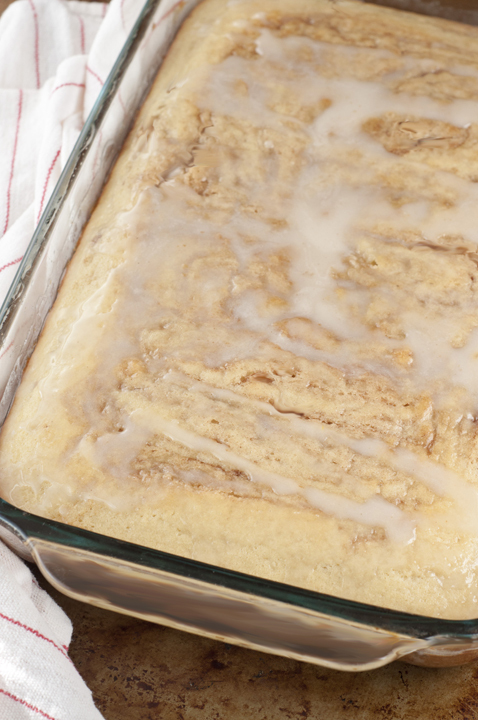 You also should check out my Crock Pot Cinnamon Bun Casserole that is to DIE for! Whisk together the flour, salt, sugar, and baking powder. Add in the milk, eggs (one at a time) and vanilla to the dry ingredients. Slowly stir in melted butter and mix until just incorporated. Pour into a well-greased 9x13 pan. Mix topping ingredients together with a large spoon (3/4 cup butter softened, brown sugar, flour and cinnamon). Use clean hands if it makes it easier. Drop evenly over cake mixture (basically plop spoonfuls on top). Swirl the topping into the cake mixture with a knife going up and down the length of the pan. Try not to go too deep into the cake with the swirls, but if you do, it will still taste great. Bake at 350 for 30-35 minutes. Check at 30 and if a toothpick inserted in the center comes out clean, it is done. It might take closer to 35 minutes, maybe even a bit longer depending on your oven and how deep you made the swirls. Whisk ingredients together to make the glaze. Top cake with the glaze by drizzling it over the cake while it's still slightly warm. Serve immediately for best taste but it's also great once cooled. Enjoy! Ashley made this cake for an event that we attended and it was awesome!! Thanks for sharing Ashley! Thanks, Nancy! Glad you liked it! I made a cinnamon roll cake recently too. I didn’t love it as much as I thought I would, but what was crazy was that I liked it better room temperature than hot out of the oven. Go figure! It is so nice to get tons of compliments on treats you share with people. You my friend are a genius! I would take this cake over any other flavor any day of the week! Love this! Yes. Yes, and Yes! 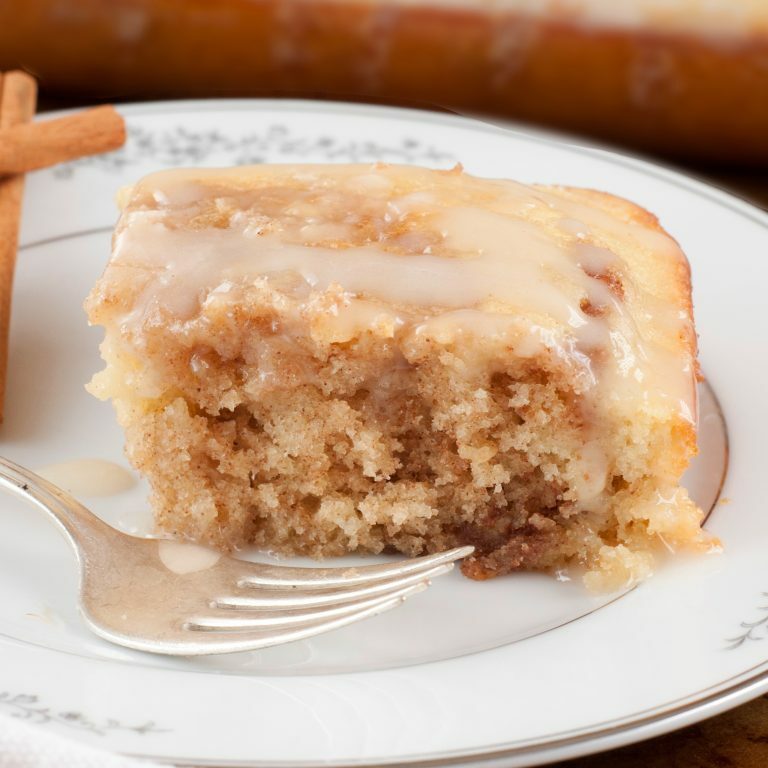 I’m already craving this cinnamon roll cake and can’t wait to make it. Pinning and will make is ASAP! Thanks for the recipe, Ashley! 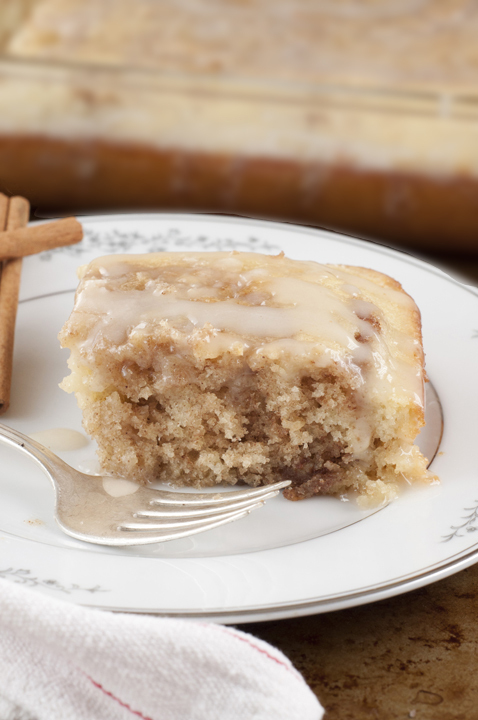 I’m in love with Cinnamon Roll right now and I can’t wait to give this Cinnamon Roll cake a try! Pinning it now! Cinnamon roll cake? That’s genius! Looks amazing. This sounds delicious! I’m a big fan of cinnamon rolls, but they are a lot of work! Honestly mine was like that too but I didn’t mind because the taste was the same! You have to make the swirls very superficial in order for the swirl mixture not to sink. But at least it still looks good and tastes great either way! -Ashley ???? YAAAAS-I love that I can have all the yumminess of cinn rolls with waaay less work! 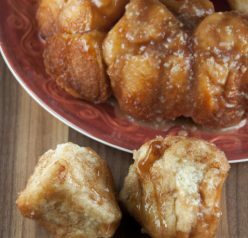 An easier way to make cinnamon rolls for my son who loves it. Thanks Renee! You will love this! This brings me so much joy. So much sweet joy…and an appetite. Clever and delicious looking!